This entry was posted on December 5, 2014 at 3:07 pm and is filed under Barack Obama, Conservative Issues, Democrats, fascism, philosophy, Politics, race. You can follow any responses to this entry through the RSS 2.0 feed. You can skip to the end and leave a response. Pinging is currently not allowed. So nicely said that it deserved to be in boldface. And as you wrote elsewhere, liberals want to believe lies. Truth is not as exalted to Libs as it is to Conservatives. Conservatives believe in absolute, objective truth. Libs, in contrast, are inclined to relative, subjective truth. Well….I think we kinda now know the truth on the real way the Affordable Care Act passed and what it really was all about. To put it in scholarly, technical terminology, liberals are postmodernists and conservatives are foundationalists. Liberals deny the reality of objective truth; conservatives embrace that there is genuine knowledge based on the reality of existence of ultimate truth. That ultimate truth comes from a Creator, whom liberals have entirely abandoned. As I write, Gruber is twisting himself into a pretzel to make sure that the lie that is the heart of ObamaCare will continue to dishonestly beat. Gruber is in an interesting position right now. He doesn’t want to talk about his salary (he got MILLIONS for his role in ObamaCare) because his statements were either true or false. If they were true then ObamaCare ought to be finished. If they were false it would constitute criminal fraud on Gruber’s part. RIO RANCHO — A New Mexico high school teacher is out of a job after a student rewrote the biblical story about Jesus handing out bread and fish to the poor to Jesus handing out marijuana to the sick. KOAT-TV reports (http://goo.gl/D84SKO) that former Cleveland High School creative writing teacher Katrina Guarascio says she recently quit after the district put her on administrative leave. According to Guarascio, a student got offended by the story and told her parents. Guarascio says she felt targeted and harassed. A Rio Rancho Schools spokeswoman says Guarascio was not forced to resign because of the students’ freedom of speech rights but chose to do so. Lies lies liberal lies!!! Not like the truth you share. Like that one about gas prices skyrocketing to $9 per gallon if Obama gets re-elected. We should have listened to you when we had a chance. Will you ever forgive us? I’m trying to remember if I wrote anything about gas prices in this article. Oh, that’s right, I DIDN’T. So here you are, dragging your fallacy of non sequitur wherever you go. Unlike liberals who predicted things that turned out to be utterly false about terrorism, foreign policy, Russia, Iran, China, ObamaCare, the stimulus, the economy, or just damn near anything – and then they don’t want to talk about it any more, I am posting your comment because one conservative has more integrity than every liberal on earth combined. Even though your rant has ABSOLUTELY NOTHING WHATSOEVER to do with the article in question but you are dishonestly pretending there is. I first point out that OBAMA’S SECOND TERM ISN’T OVER YET. And I bet if gas prices spike you won’t be back here to admit you were wrong. Because you’re a liberal and therefore devoid of honor or personal responsibility. For the record, when you look at the high gas prices seen under Bush that you liberals went so damn batpoop over, THEY OCURRED VERY NEAR THE END OF HIS PRESIDENCY. Too bad you don’t have the integrity to wait before you claim you were right and what happened to Bush cannot possibly happen to Obama. We can’t compare Obama’s second term to Bush’s second term because Obama hasn’t HAD a second term yet. And I guarantee you that if Obama GETS a second term, gas prices will be SKY HIGH. Why do I say that? Two reasons. One, Barack Obama is the “Under my plan, energy prices will necessarily skyrocket” president. Barack Obama is the president who has literally said he WANTED gas prices to go up as long as the increase was gradual so he wouldn’t get blamed. Barack Obama is the president who appointed an Energy Secretary who is literally on the record saying he wanted to see U.S. gas prices at $9-$10 a gallon. Which is to say that Obama is a radical environmentalist ideologue who believes gasoline is evil and wants to force Americans to use a more expensive “green” alternative. And two, because Iran is by all accounts at the threshold of attaining nuclear weapons because Obama has abjectly failed to deal with this crisis that the Democrats once blatantly mocked Bush for warning us about. That means that either we (and Israel) do nothing and Iran becomes a nuclear weaponized power and is free to shut down the Strait of Hormuz and drive up international oil prices at will with impunity, or else Israel – hopefully with the aid of the United States – will attack Iran to destroy its nuclear capability. Either way, I guarantee you we will be seeing gas prices skyrocketing during what would be an Obama second term. I believe that if Obama is reelected, we will see gas prices go up to the $9 to $10 a gallon that Obama’s handpicked energy secretary is on the record desiring. Again, is Obama’s second term over? It seems to me he’s got a full half of it plus yet to go. But apparently you – who worships Obama as your messiah – trust in your godless heart that Obama will heal the planet and lower the level of the oceans. Apparently you DON’T believe what Obama himself said about energy/oil prices. Because Obama’s predictions were precisely in line with mine, weren’t they? Now, what has made oil prices go down so much. Obama? NOT. Try “fracking” which has enabled oil companies to massively expand oil production. The fact is that Obama has done NOTHING to lower the cost of oil, and in fact has tried to prevent oil from being more plentiful and therefore cheaper. So what are you but a hypocrite for taking credit for it? Now do you, Obama worshiper, give your messiah praise and glory for destroying the planet’s economy, or are you just worthless fool who ascribes praise and glory for everything that makes your messiah look good but blaming Bush for everything that looks bad? Now lastly, here’s one more thing. Under which president have gas prices averaged higher? Both use the same EIA figures for their data. So based on those charts, do the math. Bush’s price averaged about $2.18 and Obama has averaged $3.15 through 2013. I found a 2014 average thru AAA at $3.253 (http://www.fuelgaugereport.com/). 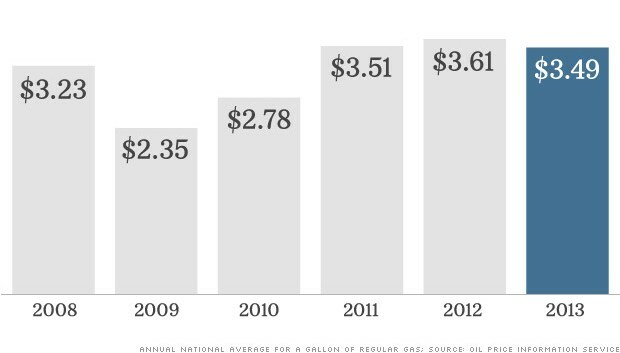 Which would place Obama’s average over six years at $3.16. But all I can say is that Obama has averaged FAR HIGHER at the pump and you have grown accustomed to SKY HIGH PRICES and Obama worship. So you are actually fool enough and frankly demon-possessed enough to insanely believe that Obama has been better at gas prices when reality screams in your fool face to the contrary. By the way, Chris Boyd, I demand you document the “lies” you accuse me of telling. I have a strong feeling you won’t because you can’t. Which makes YOU the liar. The student had the express permission by the principle to wear the rosary – which of course no one ought to have been able to ban in any free nation to begin with. There are two major factors that influence the price of gasoline. The first is the value of the U.S. dollar. If the value of the dollar increases, then the dollar value of crude oil decreases and vice versa. Crude oil makes up about 65% of the price of gasoline. Lately, the value of the U.S. dollar has increased substantially which has helped push down the price of crude oil which, in turn, has pushed down the price of gasoline. However, please note that the only reason that the value of the “mighty” dollar has increased is only because Europe and Japan have been hell bent on devaluing their currencies which has given the illusion that the dollar is strong. In case of currencies, it is all relative. The other major factor in all this is the fact that the U.S. has greatly increased its production of crude oil and is once again a major player. Of course, all this is happening on private land, not government owned land and I know how you liberals hate oil. Anyway, the current worldwide supply of oil is extremely high and this, along with the high U.S. dollar, has combined to push down the price of gasoline. Another interesting point here is that the recent emergence of the U.S. as a major supplier of crude has really hurt OPEC, which has actually increased its production in order to further drive down prices in an attempt to put the U.S. suppliers out of business, since most of our recent oil producing sites rely on more expensive fracking and shale technology to extract the oil. I think the line in the sand as far as profitability for shale and many of the frackers is near 70-75 dollars a barrel; as of today, oil is below 60. 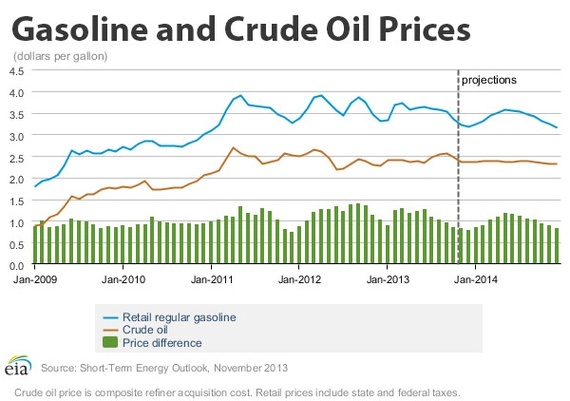 Anyway, I tell you this so you don’t go ahead and try to give the scumbag Obama credit for low gasoline prices. The low gas prices we have enjoying lately have nothing to do with him or his policies. Actually, Obama would much rather have sky high energy prices so he could push his green agenda and exert even more fascist government control over this nation. Also, I believe he wants higher energy prices to simply punish America. He absolutely hates this country and is in the process of fundamentally transforming it into the image of the beast. He has fooled many liberals into thinking that he is doing good when, in fact, he is masterminding the complete opposite. Liberalism is a mental disease and there is little hope or a cure for those stricken with it. These low prices will not last too long, though. Sooner or later, the value of the dollar will inevitably collapse sending crude oil and gasoline prices into the stratosphere. Don’t ask me to make any predictions as to how or when. The collapse of the dollar will, in part, be a result of the massive debt that Obama has incurred on America and adding millions of illegals to the welfare roles. This is by design and part of the Cloward-Piven strategy. Yes, it may appear that Michael was wrong about his prediction of 9 dollar gas. Making economic predictions is a very difficult endeavor and many even in the financial industry fail at it. Actually, most will consider you a guru if even half your forecasts are accurate or true. I trade crude oil futures for a living and many traders like myself a couple of years ago would never have guessed prices would be this low now. Also, I must mention again that high energy prices are what Obama desires, so what Michael stated was not really ridiculous at all. As far as truth and lies, I would say that this blog is saturated with the truth and that is why I come here almost every day. Michael has done a most excellent job at exposing the lies of liberalism and this demonic administration. People like you are mentally deranged and believe lies and there is probably little hope for you. It is sad, but that is what this country is becoming as we accelerate into the last days. Before I go, there is an interesting dilemma going on here in oil land. The domestic oil and gas production here have been a pretty good boon to the economy and has simultaneously helped lower gas prices which have also helped the economy. But bringing all this oil online may, in a strange irony, doom the very same industry. And then there is OPEC which is trying to further push oil lower to force these domestic companies out of profitability and out of business. If our domestic production coming from shale and some forms of fracking are halted, then oil will go back up and our economy will suffer. Of course, we could just say screw OPEC and just produce and use our very own oil, but I doubt that will happen because of those damn liberals. Anyway, this shall be interesting to see how this all unfolds and it will also be fun trying to predict what will happen, even though most will probably get it wrong. Ah, just one more thing. Low oil prices are severely hurting Russia. I think that I read one time that oil has to be above 90 for Russia to be prosperous. These low prices today, if they continue, may be the hook in the jaws that sets Russia off in these last days. First, thank you for entering into this argument, FMC. It’s nice when you can know friends have got your back in a fight when some punk tries to sucker-punch you. Second, let’s not forget that I’ve got two more years to be right before I’m wrong. And that Bush’s high gas prices occurred in the last 8 months of his last year in office. Iran gets its ICBM and goes nuclear as Obama has guaranteed WILL happen, you watch and see what happens to gas prices. Whether Iran develops its own ICBM or more likely gets it from an Obama-emboldened Russia, Iran can have nukes two months later. Anybody who believes Russia would be afraid to provide ICBM technology to Iran is just beyond a fool at this point. I appreciate FMC for pointing out yet another way we could see $9 PLUS gas – sky high inflation due to a collapsing dollar. Yes, there are still two years left and, trust me, anything can and probably will happen as the end times phase accelerates. Two years is a long time to have someone like Obama in power. If we make it that long, his policies will be wreaking havoc on this world for years to come and I am absolutely sure we haven’t seen the worst yet. Satan has access to Obama and you can be sure that he is pushing this turd towards letting Iran become full nuclear. When that does happen, high gas prices might be the least of our worries. My father recently passed away. I was sad but knowing that he is with the Lord, I am now envious. God, get me out of here and make it quick. I am sorrowful that you lost your father. You will miss him greatly, I have no doubt, but you WILL see him alive again. In fact, he will be waiting when the Rapture happens to greet you. I lost a very dear friend early this year. He was like a father to me. I smile when I think of him because he always had encouragement for me and saw me as God the Father sees me through Jesus. I pray that your memories of your dad bring you such smiles rather than sorrows. We may endure very hard times before the Blessed Hope of the Rapture as the economy plunges and the world is swept into chaos and madness and misery as it prepares to worship the coming beast and take his mark. think of your dad in the presence of the Lord, praying for his son’s blessing. Here’s the thing about liberals: they are creatures of pure feeling of entitlement. They believe they’re always entitled to their own facts just as the feel entitled to the money that other people worked to earn and build. We had a 315-point collapse of the DOW because investors understand the collapsing oil price is heralding a horrible world economy. So what does this turd Boyd want to do? Give his messiah praise for the low oil price – even tho Obama has frankly done everything he could to keep oil expensive by making it as costly as he can to extract and bring to market – while blaming Bush for the economy half a damn dozen years after Bush left office. Because he’s a dishonest member of a dishonest species and that’s how dishonest minds malfunction. Thanks for the kind words. It is never easy losing someone close, especially when it is your father. This has been a very rough year for me, probably one of the worst on record. However, as the beast approaches, I am sure it won’t seem so bad as the days become darker. The oil market is a complex animal. There are so many factors that can influence it, ranging from basic supply and demand, geopolitical, currency valuations, OPEC, interest rates etc… Although the title of the USA Today article is accurate, it does not tell the whole story. The main reason that oil is being bludgeoned currently is because of the massive supply unleashed on the market relative to demand. These very low prices are really hammering the energy sector and those stocks associated with it. I think that sector makes up around 20-25% of the S&P 500 and probably has more of an impact on the Dow, although I would have to look that one up. I have also been hearing that the Fed is thinking about raising interest rates. When they do, we probably have about 8 months to a year before the next big collapse begins. The Fed is incompetent and when they raise rates, they always go too far and burst the bubble that they already created. They are fools, but it almost seems like it is intentional. I am surrounded by liberals where I live and there is no talking sense to them. They are hopelessly warped in their reasoning and they won’t understand the truth until they are at the Great White Throne Judgment. The main reason that oil is being bludgeoned currently is because of the massive supply unleashed on the market relative to demand. There’s no question that every good father is a major part of his son’s life. And the closer the relationship, the greater the pain. Your pain and sense of loss are a measure of how much your dad meant to your life. If he didn’t matter at all, you wouldn’t feel any pain and loss at all. At the same time, because your father meant so much to you, no one would want you to be able to progress to the point where you can have fullness and joy. Obviously, there’s a tension, a dichotomy, a paradox, between the above two paragraphs. Yet both are completely true. It is faith in Christ that resolves the dilemma; because by faith you know you WILL see your dad alive again. But your assignment for the remainder of your days on this earth is to be able to pursue joy and abundant life until you go to be with your fathers. Grief is a tunnel that we must come out through the other end once again in the light. As for oil prices, the sentence I pulled from your analysis sums up the situation quite well: fracking has massively increased the supply of oil and OPEC can no longer just shut off the tap and wait for prices to be driven back up. We could say that as much as Obama has tried to serve his oil masters by banning fracking, he failed. But now in the backdrop of that abundant supply, analysts see a global slowdown – which means a forecast of far lower oil use. Which drives the current price of oil down even more as its expected future value plunges. The number one reason the price of oil is plunging now is because the market believes a bad economy is coming which will mean everything will slow down ergo sum less oil consumption. The 315-point drop in the DOW is screaming proof of that. It’s hard to see how ought to make Obama look good. But then again I’m not a liberal, which means I’m capable of understanding at least a little bit of reality. I think the ultimate straw that breaks America’s back will be the end of the US dollar as the reserve currency. And even there, Obama’s fingerprints are all over that comeuppance. 1) His insane and evil spending makes America tantamount to a psychotic drug addict to the point where his dealers realize he has to cut his losses as this addict acts in a suicidal manner. They won’t keep loaning us money. 2) Our enemies no longer fear us. 3) Our friends can no longer trust us. 4) We are no longer standing up to evil and tyranny in the world and there is no reason to justify America’s continuing existence with America as alack hole of debt spending that will take the world down with us unless the world cuts its losses. And after that, the beast will come. Obama has already guaranteed it. The Fed came out today stating that they don’t plan on raising interest rates anytime soon, that they will be patient. I don’t know, but maybe they think that the low oil prices will help keep inflation in check. After hearing this, the stock market has been on a rampage. I don’t think that we will see a top until sometime in the next interest rate raising cycle, which Yellen has said won’t be anytime soon, whenever that be. In the mean time, the bubble that is the stock market will keep getting pumped higher and higher. I look for oil to test the 50 area. I don’t see how they can let interest rates get to where they should be considering the massive amount of government debt. Maybe they keep rates low until a massive wave of inflation engulfs us. Regardless of what rout the Fed takes or what happens, this will eventually end very badly. Merry Christmas to you, too, Michael, and hope you enjoy the holidays with your friends and family. Agreed. It will end vary badly. The night before the US economy plunges in the worst collapse in the entire history of the world, the talking heads will be assuring us that everything will be fine. We’re at something around $250 TRILLION in unfunded liabilities. We’re a dead chicken staggering; liberalism has already killed us. God foreknew these days were coming. He knew OBAMA was coming, knew the toxic wickedness that Obama would poison the soul of America with. And He knew the Antichrist would follow Obama. Yikes! Sometimes I hope you are wrong even when I know you are right. But Merry Christmas, dog walker, from one who believes that God IS u in control and WILL ultimately bless all those who bless Him even as He now begins in these last days to curse all those who curse Him.